forward double V berth is 190x150 and the dinette single bed is 1.95x0.60 headroom is 1.95 in galley and 1.75 in forward cabin. 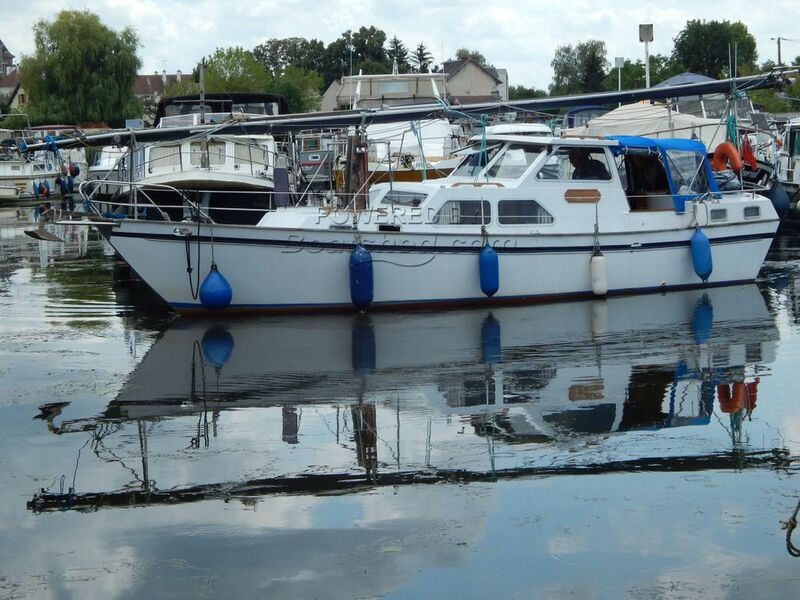 A motor sailor for sale inland waterways of France. This Beachcraft is an "amateur build" by a professional who spent his working life with the Dutch yard. A nice lay out with lots of quality wood panel and furniture, brass and a classic ambiance for this motor sailing boat. Note however there is only a cockpit shower installed at present. A great central cockpit covered by a bimini or a full cover with zip around to make the boat completely and privately closed. Aft cabin suitable for 2 with storage. Forward double bed in an open space saloon and galley. The mast is easily lifted thanks to a counter balanced system. One person can operate it. Sails are stored in bags inside the cockpit lockers but have not been used for some time. They have been checked by professionals in Netherland. A lovely and full of charm motor sailor cruising along the French waterways to its way to the Med area. For more information, please contact Graham, your local broker at Boatshed Bourgogne. This Motor Sailor 34 has been personally photographed and viewed by Magali WHARMBY of Boatshed Bourgogne. Click here for contact details. Bonsoir,j'aimerais confirmation....il s'agit bien d'une dérive relevable. Et pouvez vous me dire à quand remonte le dernier carénage...?